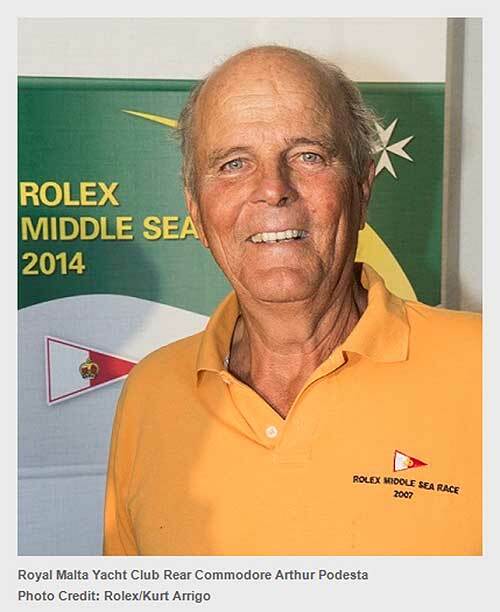 Maltese sailing pioneer Arthur Podesta has sadly passed away. Arthur was a long standing member of the Royal Malta Yacht Club committee having served for many years, acting in many roles including that of Commodore. Arthur will long be remembered for his love of sailing and was a regular competitor in local and foreign regattas. Arthur, together with handful of others, contributed substantially towards the development of sailing as a sport for Malta & Gozo. He excelled at reaching across all levels of society to communicate his passion for the sea and sailing. It was particularly poignant that Arthur passed away a few days before the start of the 36th Rolex Middle Sea Race, the race with which his name was practically synonymous. Arthur in fact had the distinction of having participated in every race since the inaugural start in 1968 and was also part of the crew on Josian, winner of the race in 1968. The funeral will take place on Wednesday, 7th October at 14:00hrs at St. John of the Cross, Parish Church, Ta'Xbiex. Arthur leaves to mourn his loss his wife Christine, his children Maya, Aaron and Christoph who all three have inherited a deep love of the sea.